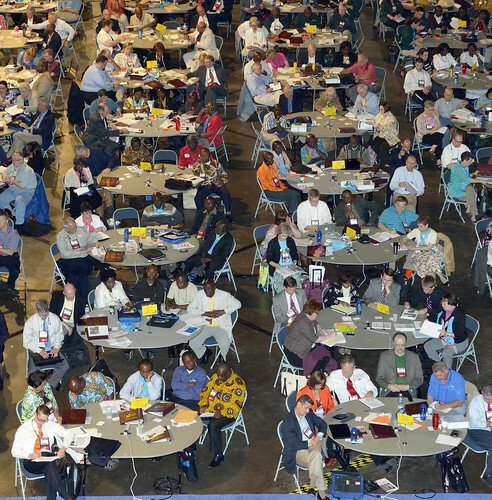 Delegates to the 2012 United Methodist General Conference in Tampa, Fla., are sitting at round tables for the first time, a step designed to encourage better discussion of issues facing the denomination's top legislative body. Meeting once every four years, General Conference is the only body that can speak as The United Methodist Church. A UMNS photo by Paul Jeffrey. Click on image to enlarge. View more photos. Delegates spent most of April 27 in 13 legislative committees, and in the evening they gathered for An Act of Repentance toward Healing Relationships with Indigenous Peoples. The Superintendency Legislative Committee agreed to a proposal from the Council of Bishops seeking a constitutional amendment that would permit them to assign a bishop without a residential assignment to serve as council president. If approved by a two-thirds majority of the assembly, the proposal must still be ratified by two-thirds of all annual conference members voting on the amendment. The General Administration Legislative Committee is assigned the massive task of reviewing all structure proposals. In a straw poll, 48 committee members expressed a preference for multiple agencies, and 35 favored the proposal from the Connectional Table that would place nine of the 13 agencies under a single governing body. Committee members agreed to begin their work with Plan B, an organizational plan submitted by an ad hoc group of delegates that retains four program agencies, continues the General Council on Finance and Administration, and discontinues five general agencies and expenses of 372 board members. This is only the beginning point. The plan will be changed before presentation to plenary sessions, which begin April 30. Plan B architects already changed their original proposal to allow United Methodist Communications to remain a separate agency. Even if the legislative committee proposes a revised Plan B, a few delegates expect a minority report supporting the Connectional Table plan to be submitted alongside the majority report. While some committees are meeting in large ballrooms that provide adequate space for subcommittee meetings and visitors, other committees were assigned smaller quarters that limit the number of visitors and make dividing into subcommittees difficult. The Rev. Mark Holland, a pastor from Kansas City, Mo., said the room assigned to the Judicial Administration Legislative Committee was so small that sounds from the two subcommittees made it difficult to hear. One of the subcommittees moved outside. Once outside, Tampa Bay traffic still made hearing difficult, and a helicopter landing on the top floor of a nearby hospital stopped conversations entirely. The subcommittee attempting to rewrite procedures for handling clergy trials is always accompanied by three translators. An increased number of non-English-speaking delegates has resulted in frequent calls for speakers to slow down to enable translators to keep pace. The issue of homosexuality continues to surface in a variety of ways during the gathering. Following nominations for Judicial Council and University Senate during the evening plenary on April 26, Mark Miller, an openly gay delegate from the Greater New Jersey Annual (regional) Conference, asked for a point of personal privilege. After several delegates rose to put their hands on his shoulders during his impassioned plea for greater openness, Bishop Robert Hayes Jr., the presiding officer, ruled him out of order. “Will you pray for us?” asked Miller. “I will certainly do that,” said Hayes. An extended debate on the rules resulted in abbreviated time for holy conversations. In an interview later, Minnesota Area Bishop Sally Dyck said it was “very, very unfortunate” that there wasn’t enough time for the holy conversations. “It is an issue that just truly seems to fracture the church, and that’s why we wanted to have some time of holy conferencing,” said the bishop, who led plans for the conversation on human sexuality. Miller later met privately with a number of General Conference officials. Delegates leaving the April 26 evening worship filed through lines of some 300 people with colorful stoles marking their support for efforts to change current laws forbidding the ordination of homosexuals and the conducting of same-gender services of union. As the delegates left the assembly hall, a few stopped to hug participants or join the demonstrators. A few problems with keypads with low batteries emerged early in the first plenary session, and the level of microphones had to be adjusted. Despite some hi-tech visual effects, technical problems have been at a minimum. An underappreciated computer system, called the Conference and Legislation Management System (CALMS), enables recorders in each legislative committee to enter the approved or revised petitions (now called calendar items) into the Daily Christian Advocate. “This is the third General Conference we have used the system,” said Mike Cunningham, CALMS administrator. “We have honed it to a fine operating application that legislative recorders find easy to use." * Peck is a retired clergy member of New York Annual Conference attending his 12th General Conference, four times as editor of the Daily Christian Advocate and three times as a member of the UMNS news team. News media contact: Tim Tanton, Tampa, Fla., (813) 574-4837, through May; after May 4, Nashville, Tenn. (615) 742-5470, newsdesk@umcom.org.